With plenty of moving services, Meathead Movers is fully prepared to make Grass Valley your new home. Our clean-cut student athlete movers are dedicated to fulfilling all your moving needs efficiently. Welcome to Meathead Movers of Grass Valley! If you are moving to or from anywhere in Grass Valley, we are the moving company for you! Our professionally trained student-athlete movers and our moving concierge service are here to help you with every stage of your move in Grass Valley. Experience all that Gold Country has to offer in Grass Valley. In the heart of the Sierra Nevada Foothills, Grass Valley, is a picturesque town that quickly charms its visitors and residents. This town has a combination of new buildings and original 1800 Gold Rush era buildings which help take people back to a simpler time. Take a hike through any of Nevada County’s beautiful trails, get soaked on a whitewater tour of the American River, visit the Empire Mine, listen to a concert at the Grass Valley Center for the Arts, or enjoy a meal or glass of wine at any of Grass Valley’s fantastic dining facilities and wineries. No matter what your tastes are, there plenty of activities to enjoy in Grass Valley. 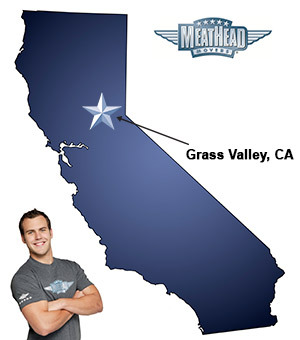 If you are considering a move to Grass Valley, Meathead Movers is here to help. Our moving company specializes in local, long-distance, and commercial moves to, from, and within Grass Valley. We also provide reliable packing, storage, on-site relocations, and our distinctive moving concierge service. All our student-athlete movers are thoroughly screened and trained before their very first move. With branches not just in Grass Valley, but all throughout California, we are your one stop resource for all your moving needs, no matter where your California move takes you. In fact, you can see what your neighbors in Grass Valley have to say about us. With our 100% satisfaction guarantee, the only thing you have to lose is the stress that comes from moving! So contact us today for a free no-obligation moving quote and to learn how we can help you on your next move! Moving to Grass Valley? Here are some helpful resources. View more Grass Valley resources.